This joint post with Alex Cobham first appeared on Views from the Center. It would have been easy for David Cameron to rest on the government’s laurels – after all, the UK is the only G-8 country to have met the target of spending 0.7% of GNI on aid. The G-8 could have made the usual bouquet of announcements about how their aid budgets will be spent – $50m on smallholder agriculture and $20m on microfinance. But – remarkably – David Cameron took on a much more challenging agenda. He asked the G-8 to “get its own house in order”: that is, to identify and fix the systemic problems which help create and sustain poverty around the world. He has not succeeded yet in getting agreement to all the changes that are needed. But he has focused the world’s attention on these key issues, and he has set in train processes which are explicitly aimed not only at protecting tax revenues for rich countries but of ensuring that the system works for developing countries too. For that he deserves much credit. Well said Owen Barder and Alex Cobham. It was interesting to see, post G8 (it even started about a week beforehand), pundits do a nice Cameron-bashing job. His presumed crime: not having achieved enough and not being able to do as much as he wanted to. I’d answer that in fact, he’s actually shown amazing vision by leading a transparency agenda that is leaps ahead of what one would expect from a “classic” G8 presidency. Granted, not everybody is 100% on board. It’s easy to see that France is a willing partner but that there is more reluctance from others (US and Canada in particular) to fully climb aboard the beneficial ownership transparency train. Don’t get me wrong though: The US, is a true pioneer in government data transparency. But when it comes to beneficial ownership, they’re still unsure of what the road ahead looks like. Especially because the UK proposal would translate into somewhat heavier regulations for businesses, like forcing companies to divulge their intricate ownership structures and shareholdings patterns. This is something economies which are favoring market self-regulations are worried about. And I would say, rightfully so: forcing companies into something they don’t want to do is yet another fight with businesses, at the very same time when economies damaged by the financial crisis need to rebound. Now that things are finally getting better, (at least in the US) it might not be the best time to start imposing a large regulatory fight on business investments. One wants investments to flow in, not out – which is exactly why Cameron declared that if others would not move on beneficial ownership, UK won’t move either for the moment, so as not to put British companies at a disadvantage vis-à-vis others. Cameron, again, is right: If I had to invest in one of two markets, one of which is more stringent on disclosure than the other, I might be inclined to exercise my right to good sense and go invest my money in the less regulated market. Which is why beneficial ownership regulations would only work if adopted by all major economies at once. The UK cannot afford play the lone ranger on this, and Cameron knows it well. That’s exactly why the G8 only ended up with a commitment from every country to prepare an “action plan” on beneficial ownership. This will give G8 member states some visibility on their neighbor’s direction and timetable. If countries can see each other’s cards clearly, fellow players at the G8 poker table will be able to make their move together, incrementally, in a much less risky fashion. So I agree that this process will take a few years. Although, and that’s where I start to differ from the UK strategy, I do not see a single way to get there. I don’t believe regulating businesses on beneficial ownership will actually do the trick. Sure, regulations could be enacted that would require businesses to self-disclose their relationships with other corporate entities. But in a world of ever-complicated corporate networks and shareholding patterns and ever-creative CFOs(who sometime create companies for the purpose of single transactions_ no regulator will be able to sift out the true from the false, or the reported from the hidden. Would you ask a burglar for his burglary map and expect it to be a representation of the truth? I know I wouldn’t. So then why do regulators believe that their call for information about corporations’ true beneficial owners will be met with accuracy? And if some information is missing, what would the penalty be? How would it be enforceable? Will a KPMG be called do to a full audit? It won’t work in practice. That’s why I suggest a different way: The Open Data way. Today, every corporation in the world is registered in national, or local, corporate registries. So imagine a world where all this data is freely available and out there for anybody to access, for free. Imagine that the ID card for any given company includes Directors, Shareholders, and even Filings. Now imagine that all that data, from all jurisdictions around the world, is aggregated in a single gigantic database. You could just plug in the name of a company and the system, through relational analysis, would produce a picture of the full network in which that company belongs. A real dream for journalists, civil society activists, regulators, and even the private sector (companies want to know about the other companies they are dealing with). This new data index looks at the state of play of how countries enable transparency of information about registered corporations. It then goes further, by aggregating open registry information. This tool generates open-source, transnational datasets that can help curb corruption, check beneficial ownership, and deepen competitiveness analysis, so that the private sector can also benefit from transparency. For instance, if you search for a particular company on this website, you can not only see corporate registration information for that company, but also(and this is revolutionary) generate a visual representation of the corporate network to which that company belongs, as well as the registry information of all the companies in the network. The potential benefits for governments, media, citizens, and the private sector to be able to map the connections between companies, are enormous. I explain more in this blog: http://blogs.worldbank.org/voices/solving-g8-transparency-equation-businesses-bottom-line-development-impact-open-and-collaborative. 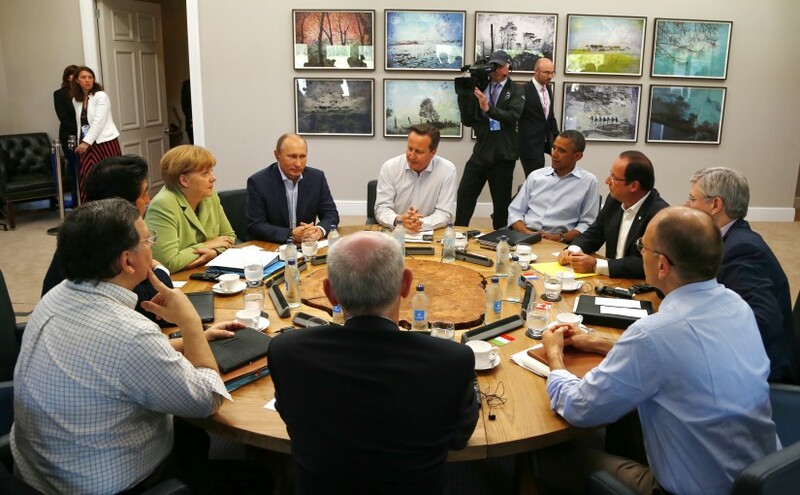 There are many roads to beneficial ownership for the G8 leaders. I tend to prefer this one, as it is based on open data and crowd-sourcing of an application on top of such data. Much more efficient in my view, than hard to broker, and hardly enforceable, business regulations. Next Next post: Development Impact Bonds – a new business model for development?